Click to read this week's Connect Ed message. "The function of education is to teach one to think intensively and to think critically. 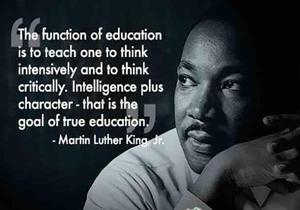 Intelligence plus character — that is the goal of true education." Martin Luther King Jr. I hope you all enjoy the day off tomorrow in celebration and honor of the life and work of Dr. Martin Luther King Jr. As I read the quote shown above, I smiled to myself thinking... I'm so proud of Stony Hill staff because I believe this is exactly what they do, each and every day. I invite you to join me this Friday for a Principal’s Coffee Hour from 8:00 – 9:00 a.m. Stop by to have coffee and treats, share ideas, ask questions, or just check in on what’s new at Stony Hill. The PTO’s first Dine Out is on January 30 at Red Robin from 5-8. The school receives 10%. There is also a chance to win a Red Robin gift basket, and the PTO has a raffle that evening as well. Hope you can make it! Our students enjoyed a fantastic assembly with author/illustrator, Jarrett J. Krososzka! Thanks so much to Julia Max for applying for the W.H.A.T. grant, and to the Wilbraham-Hampden Academic Trust, for making his visit to Stony Hill possible. Children were so engaged in his presentation, and I heard several comments from Jarrett that aligned perfectly with what we teach children about writing, illustrating, creativity, and perseverance. The Artistic Dance Conservatory is coming to Stony Hill on 1/25 to perform, The Magical Divide. Thanks to our PTO for arranging this opportunity for our students to see a ballet! I looked up the performance and was able to find this snippet that helps us prepare for what children will see: "Behind every blade of grass, every ray of sunshine, and every chirping robin lies a little bit of magic. Join us for an original ballet created by Rebecca Sutter on a journey to an unknown world of fairies and princesses, joy and darkness, and dancing that lights up the stage. The Magical Divide will keep you routing for Mother Earth as she and a young girl named Maya open the world's eyes to the beauty and magic that surrounds them." Here's a little something to get you pumped up for tonight's big game!